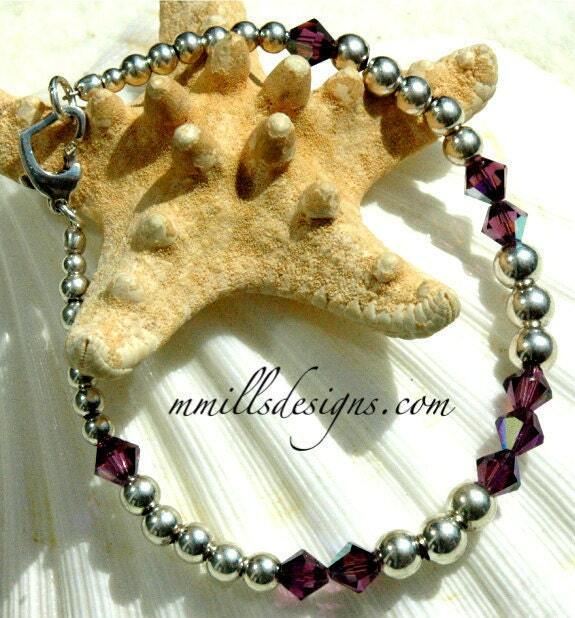 Another graduated bracelet made with bicone amethyst swarovski crystals, three sizes of sterling silver ball beads, and finished with a cute heart lobster clasp. 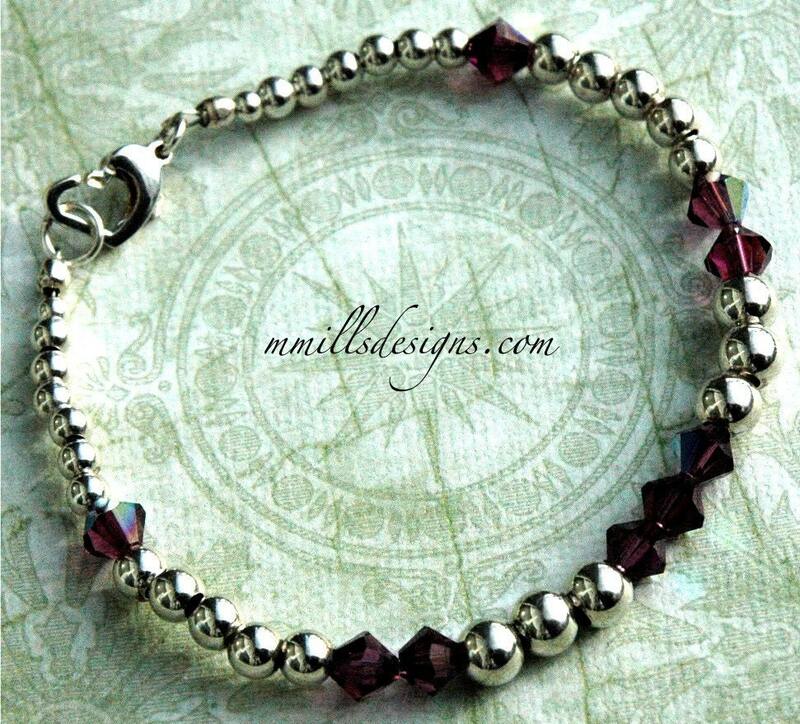 Bracelet measures 8" with a sterling silver heart lobster clasp. If you need a smaller or larger size, please state your desired size at checkout in the "message to seller" box and I will be happy to make the needed adjustments free of charge. Please note that changing the size will change the design slightly from the item pictured. Business transfers. If I sell or merge my business, I may disclose your information as part of that transaction, only to the extent permitted by law.Compliance with laws. I may collect, use, retain, and share your information if I have a good faith belief that it is reasonably necessary to: (a) respond to legal process or to government requests; (b) enforce my agreements, terms and policies; (c) prevent, investigate, and address fraud and other illegal activity, security, or technical issues; or (d) protect the rights, property, and safety of my customers, or others. Complain. If you reside in the US and wish to raise a concern about my use of your information (and without prejudice to any other rights you may have), you have the right to do so with your local data protection authority. For purposes of US data protection law, I, Mary Mills, am the data controller of your personal information. If you have any questions or concerns, you may contact me at mary@mmillsdesigns.com. 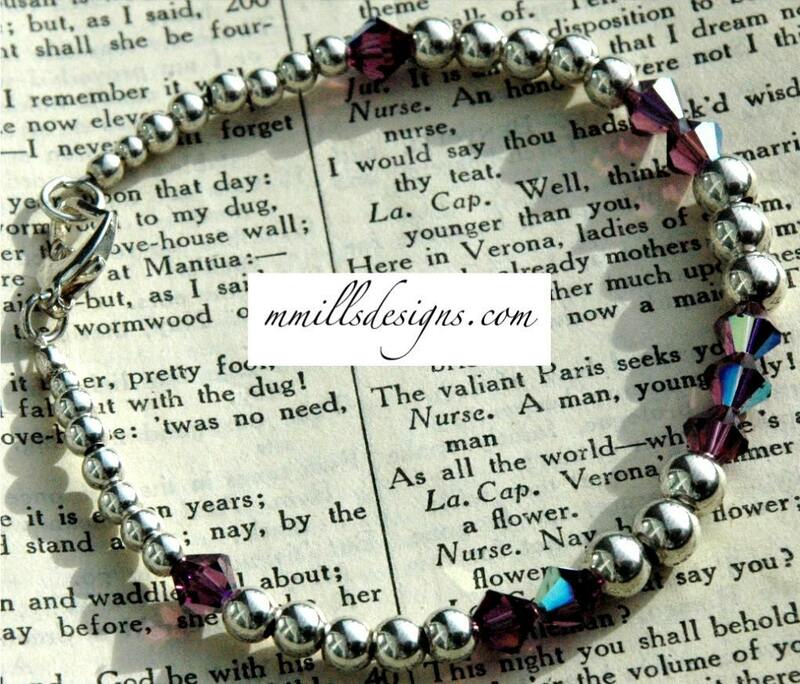 Most bracelets & necklaces can be resized, or I can make a similar one in your size. If you have an idea for a piece you would like me to design, or you would like an existing piece with some changes, please contact me at mary@mmillsdesigns.com. I do not charge for resizing unless I have to add a substantial amount of sterling silver or crystals. Please remember that custom orders are always welcome so please contact me and let me know what I can do for you! I require 50% of the item price up front before I start working on your custom item. Once the item is completed the rest of the balance is due before shipping. All items, except custom stamped jewelry, will be shipped within 2 to 3 business days from receiving payment. 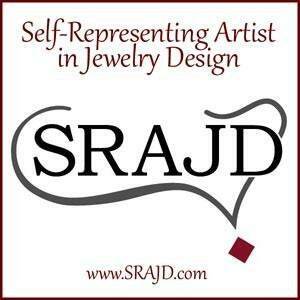 Sterling Silver hand stamped jewelry will be shipped within 5 to 7 business days from receiving payment. I ship Monday through Friday, excluding holidays. The shipping fee includes the cost of postage, tracking, packaging, overhead and handling costs. Sterling Silver will tarnish if left out in the elements. Contact with oxygen and sulfur in the air can cause your silver jewelry to tarnish. A tarnished appearance occurs when sulfur becomes bound to the surface of the silver. I have found that the best way to prevent tarnishing is to store jewelry in a plastic zip top bag with a square of anti-tarnish paper. Do not wear your jewelry while showering or washing your hands. You should clean your silver jewelry with a soft cloth or a jewelry cleaning cloth. A jewelry cleaning cloth has two sheets of cotton; the outer layer is for buffing, and the inside layer contains special chemicals that will clean and shine the silver. My regular packaging is as follows: Each item is placed in a clear jewelry size zip bag with an anti tarnish piece of paper, it is then wrapped in tissue paper and then placed in a larger zip bag with care instructions. I do not Gift Wrap unless it is requested and an additional charge of $4.00 will be added to your invoice.